Towards the end of September Barcelona begins to limber up for the largest event on its festival calendar, La Mercé, a celebration of the city's patron saint "Mare de Deu de la Mercé". The festival heralds the end of summer and the onset of the autumn months. The festival is a real big deal for the people of Barcelona and the still temperate weather means that, in true Mediterranean fashion, must of the fun takes place outside. There's a massive amount to do whilst the festival is on with events popping up all over the city and over 3000 artists and performers on display with over 500 activities to watch or take part in. The festival has a long and proud and first took place in 1902; today it's a fantastic blend of tradition and innovation. You'd really need to write a novel to keep on top of everything that goes on at La Mercé each year so, we'll just have to settle for some highlights. 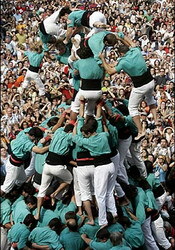 We start with one of the oldest traditions; the human towers or "Castells" are a real must-see, sometimes as much as ten stories high they're a fantastic display of teamwork, agility and balance. A recurring theme throughout the festival is the celebration of fire and one of the most exhilarating experiences of La Mercé is the "Correfoc" (the "Fire Run") where costumed fire-breathing devils rampage around the streets in a colourful pyrotechnic display. Kids absolutely love this sort of thing and audience participation is a big part as the devils chase after those foolish enough to get in their way. Another favourite of the children is the "Dragons and Giants" procession which starts in the Plaza Real next to Las Ramblas. Foodies and wine lovers shouldn't feel left out either as there is no shortage of indulgence in those areas. Food and wine shows run throughout the festival showcasing local produce and allow you to try and buy the best that Catalonia has to offer. Festivities aren't just kept on the ground either, La Mercé also celebrates the sky with static hot air balloon flights, kite displays and other aerial exhibitions taking place throughout the festival on the city's beaches. Other areas around the city to look out for are the Centro de Cultura Contemperanea de Barcelona where you can view street theatre, Moll de la Fusta which will be giving centre stage to numerous circus acts and Plaza St Rei where various dance troupes and performing artists will be vying for your attention. There's also a museum open day where many of the city's museums and galleries can be entered free of charge including the Picasso museum, the Museum of History of Catalonia, the Maritime Museum and many more. The culmination of the festivities is called "Piromusica"l - the finale involves music and a huge fireworks display choreographed together for an amazing audio-visual experience. 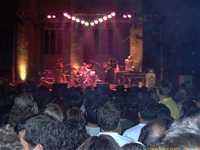 A big named music star is usually brought in to play the finale and 2005 saw local singer and composer Pep Sala having the honour of closing out La Mercé. For tourists La Mercé offers a perfect opportunity to see Barcelona at its best - it's a colourful, vibrant spectacle which offers something for all age groups and all tastes. It also offers visitors the perfect opportunity to see more of this wonderful city.